The wooden marker is pretty easy to miss as you drive down Ash Street approaching Fairview Avenue on Spokane’s North Side. Set back off the road, the marker pays homage to the site where Chief Spokane Garry established a school in 1830. The sign acknowledges that it was the first school in what was then the Oregon Territory, where Chief Garry taught religion and farming to members of the Spokane Indian Tribe. 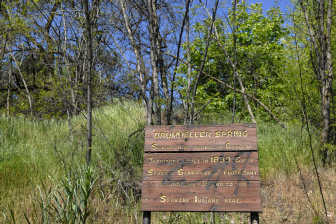 What the sign doesn’t commemorate is that right there, at what we now know as Drumheller Springs Historical Park, there were naturally occurring springs, said to be the only freshwater spring for those traveling between Spokane Falls and the confluence of the Spokane and Columbia rivers in the first half of the 1800s. Historical accounts refer to the springs as an important source of pure drinking water for tribal members, fur traders, missionaries, soldiers, miners, stockmen and others in the region. The location was an important Indian campsite for thousands of years, once rich with camas, bitterroot and other plants of importance to the tribes. Historical archives indicate that tribal members made their last annual trips from the Spokane Indian Reservation to camp in lodges near the site in the 1930s. Also known as Spring Hill, Garry’s Springs and Lone Pine Springs, the 12-acre site carries the official name of Drumheller Springs Historical Park, named for stockman “Uncle” Dan Drumheller, who built a slaughterhouse on flat land below the springs in the 1880s, installing pipes and a tank to collect and store water from the springs. Various portions of the site were donated to the city over time and the final section was deeded to the city of Spokane by the Comstock Foundation in July 1966 to be used as a public park. The park is not filled with swings and other “toys,” but rather, it is a protected conservation park, one that has attracted civic and school groups and others to help restore native plants and recapture its original natural beauty – not always easy to do in an urban setting. In 2005, members of the five Upper Columbia United Tribes – Coeur d’Alene, Kalispel, Kootenai, Spokane and Colville – began a restoration and cleanup project there as part of the Adopt-a-Park program of the Spokane Parks and Recreation Department, which manages the site. It is said that portions of the trail that once led from downtown Spokane all the way to Canada are still visible there. That’s quite a bit of history right in the middle of a north Spokane neighborhood.